Readers Theater is a form of theater where lines are not memorized but read by actors from a script. Performances may be simply staged – the actors are seated and stage directions are read aloud – or they may be fuller productions using sets, costumes and blocking. Readers Theater is a good way for new actors to try their hand at public performance and to gain familiarity with performance skills as well as script analysis, character development and other acting tools. It is also a delightful way to enjoy hearing new plays with fellow theater fans! 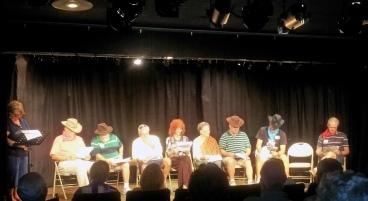 Lemon Bay Playhouse Readers Theater is open to anyone interested in reading or hearing plays in a group setting. We meet at Lemon Bay Playhouse on the first Monday of each month from 9:30 AM to noon. No theatrical experience is necessary to participate. A variety of plays and other materials adapted for Readers Theater format are read and the roles rotated to include as many participants as possible. In addition to our monthly gatherings open to all, LBP Readers Theater will be available to perform at local libraries, clubs, and other community organizations free of charge. Auditions for roles in the performing casts will be held seasonally and participants must be available for rehearsals and performances during the day and occasional evenings. April 2010 saw Readers Theater first ticketed event as we presented “Shorts Aloud: An evening of Drama and Comedy”. Six short plays were presented in Readers Theater format, along with props and costumed actors. It was a resounding success and we plan on making the evening an annual event each Spring. Any actor or any individual who comes to our monthly gatherings is welcome to participate and get a taste of what it’s like to be on stage “under the lights” — without memorization. Email Kathy Amelia at kamelia0951@comcast.net.